Ken Beaumont was one of those radio 'names' who had many hundreds of broadcasts to his credit and yet is so poorly documented that I doubt if many of those who remember him even knew what instrument he played, let alone anything about his career! Indeed, his fame as a bandleader represented only the last 20-odd years of a very diverse career. Ken Beaumont was born in Blackpool on 24th October 1915. His musical education was at the Royal Manchester College of Music, and even whilst still a student he gave recitals of Lieder and ballads. During his career he was a singer, disc jockey and actor, taking part in many North Region Revue programmes prior to moving to London in 1936. Whilst living in the North he had played and sung with Larry Brennan's Winter Garden Dance Band in Blackpool, with which he broadcast and recorded. He was one of the first radio artists to become a disc jockey, and he presented a programme entitled 'With Vocal Chorus' between 1937 and 1945. He also broadcast on television and radio from Hollywood, as well as performing on commercial radio. Ken was with several leading dance bands, including those of Henry Hall, Oscar Rabin and, notably, Billy Ternent and the BBC Dance Orchestra, being one of their featured vocalists for much of the war when he was with the BBC's Variety Department, which, at that time, was based in Bangor. 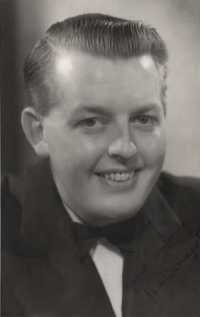 It was in 1946 that Ken Beaumont formed his sextet for broadcasting. Initially billed as Ken Beaumont's Music, this ensemble was clearly a favourite with radio listeners, becoming particularly associated with 'Music While You Work' and playing no less than 289 editions. The sextet performed in other shows as well, and I have clear memories of setting my alarm clock for 6.30 a.m. in order to hear their regular 'Bright and Early' broadcasts. By the early sixties they were also frequent contributors to 'Morning Music'. Ken Beaumonts ensemble was essentially a dance band but often included light music novelties in its programme for contrast. Listeners may recall that they liked to commence and conclude their broadcasts with medleys of traditional folk tunes which Ken arranged for the group. violin, saxophone/clarinet, piano, bass, drums and two guitars, one of which was played by Ken himself. Curiously, he adopted a rather low profile within the group, playing the rhythm guitar rather than the lead. The band's violinist was Danny Levan, who also had his own sextet. In the 1950s, in between 'bashing out Music While You Works', as Ken put it, it would appear that he was doing a stage act with Margaret Heath (soprano and violinist). Around this time he occasionally broadcast in variety shows and had his own series  Tuneful Twenties. By the sixties, Ken was broadcasting exclusively as a bandleader and, around 1963, possibly with a view to updating his style, he dispensed with the violin, substituting an electronic keyboard (probably an electronic accordion). In my opinion this lost the band a lot of tone colour. The BBC was very particular about bands being in the studio in time for the MWYW rehearsals at 7.30 a.m., and so was Ken Beaumont, who, on New Year's Eve 1962, insisted that the sextet sleep in the studio overnight as there was snow on the ground and he didn't want to risk a delay. The fact that the musicians might 'over-celebrate' the New Year might just have occurred to him as well! Following the demise of MWYW in 1967, Ken Beaumont's broadcasts became infrequent, with just the occasional session for 'Breakfast Special' in the late sixties. When 'Music While You Work' was revived in the early eighties, Ken rang the Producer to advise that, as he had retired, he did not want to participate. Given the reluctance on the part of the production team to use 'old names' at that time, it is unlikely that he would have been invited anyway. Ken Beaumont who, I am told was a delightful man, died on 11th March 1996, aged 80.